A decomposed granite pathway winds through the proposed flood plain. As students stroll about, their eyes trace the rammed earth retaining wall noting each representative strata coursing across the geological plane. 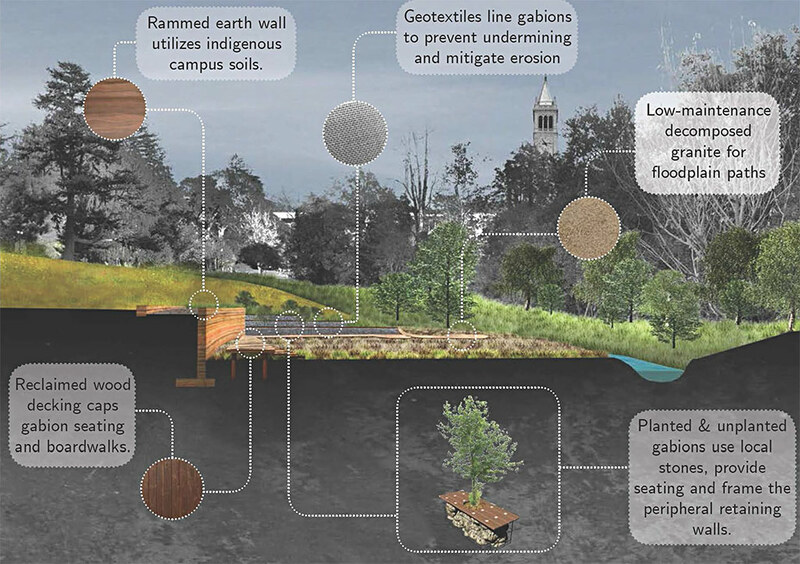 In 2012, during the second year of my Master of Landscape Architecture program at Berkeley’s College of Environmental Design, I volunteered to take part in the first Campus Rainworks Challenge — an annual student competition commissioned by the Environmental Protection Agency, envisioning how campuses can play a role in stormwater management and general water infrastructure improvements. Although a powerful Bay Area storm at the time offered us a first-hand glimpse of the troubling conditions of campus stormwater management — especially in Strawberry Creek which became a dangerous chocolate milk-tinted torrent — in the end, our UC Berkeley team did not even place in the 2012 competition. This year was a different story. A ten-person, transdisciplinary student team, mostly from CED’s Landscape Architecture and Environmental Planning Department, took second place in the EPA competition’s Demonstration Project category, among 75 national teams who participated. It is laudable that these students received no academic credit for their work — they volunteered for, and executed this competition proposal entirely in their free time. Campuses are interesting patches in the urban fabric. Constantly growing and modernizing while typically spatially constrained, they still often remain places of large public open spaces and landscaped areas. This pastoral ethos engenders a certain degree of ecologic functionality, especially in large and dense cities. Led on a campus tour by Berkeley Campus Landscape Architect Dave Johnson, our team quickly selected a site of particular interest: the so-called Wickson West Oval, just upstream from the confluence of Strawberry Creek’s two forks in the eucalyptus grove on the campus’ western edge.  UNBOUND makes visible the invisible in aesthetically engaging ways, while preserving ecosystem services, and achieving functional goals in stormwater management and riparian restoration through an ever-changing, novel, and experiential journey for users. The site, at just under two acres, hosts a 400’ reach of Strawberry Creek’s North Fork. The creek is lined with century-old masonry bank revetments that are steadily degrading. Badly incised and overgrown with Algerian ivy and strangled trees, it is an inadequate conveyance for stormwater coursing between a bridge that is too low and a dramatically undersized culvert at the creek’s downstream “exit” from the site. The apparent opportunity at the West Oval is embodied in a long, low, sloping lawn on the creek’s north bank. It is often boggy at its base, requires regular maintenance and represents a notably underutilized space in immediate proximity to one of the Creek’s most problematic stretches. The students’ proposal, Unbound, emerged from several charrette-type design exercises and weekly meetings where the students developed their concepts with input from faculty, local professionals, and assistance from Berkeley Environment, Heath and Safety specialist, Tim Pine. 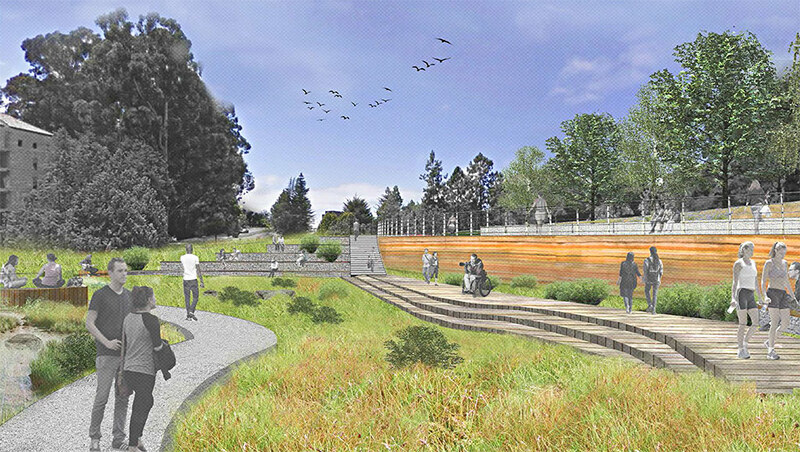 Unbound presents a very simple concept — cut back the lawn to open an ecologically rich floodplain and seasonal retention pond, using the excavated material to establish a scenic overlook for public use and enjoyment. Materials generated from the campus’ constant evolution, such as reclaimed wood from building renovations and stones and earth from new site excavations, opened up a building materials “menu” and framework rooted in basic sustainability principles which the students applied to their scheme. A rammed-earth wall using fill generated on site serves as the backbone of the proposal. 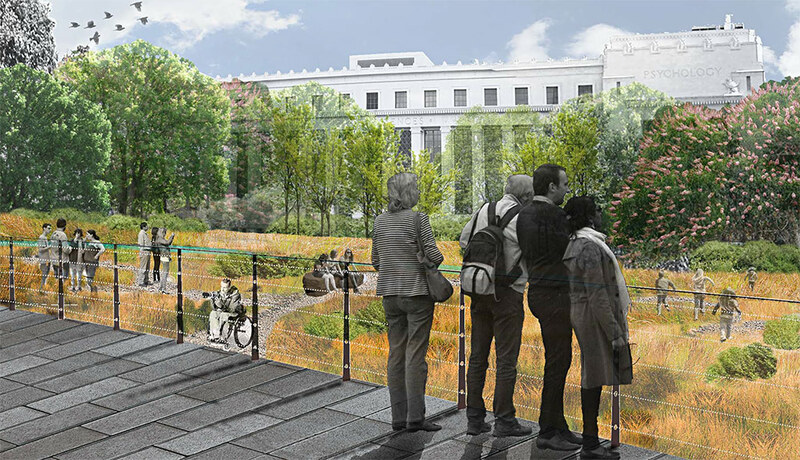 The students also imagined the proposed site restoration as a living laboratory, with features pertinent and valuable to myriad, ongoing academic and student endeavors. 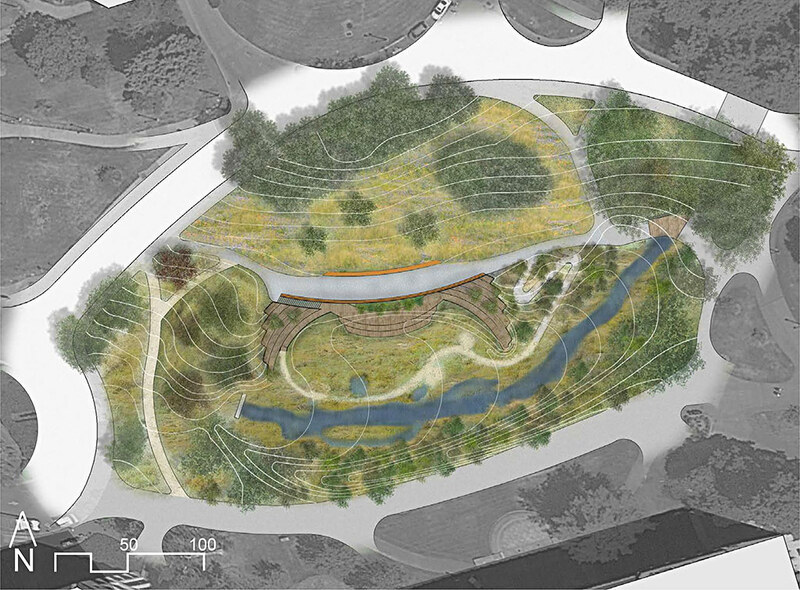 The benefits of the Unbound proposal are multidimensional: re-activating a naturally dynamic space, increasing access for all, improving habitat and expanding native ecotones, showcasing seasonal processes, and taking pressure off of the urban stormwater system by detaining up to 37,000 cubic feet of water in a storm event. The project also increased the academic relevance and value of the participating students’ education experience. 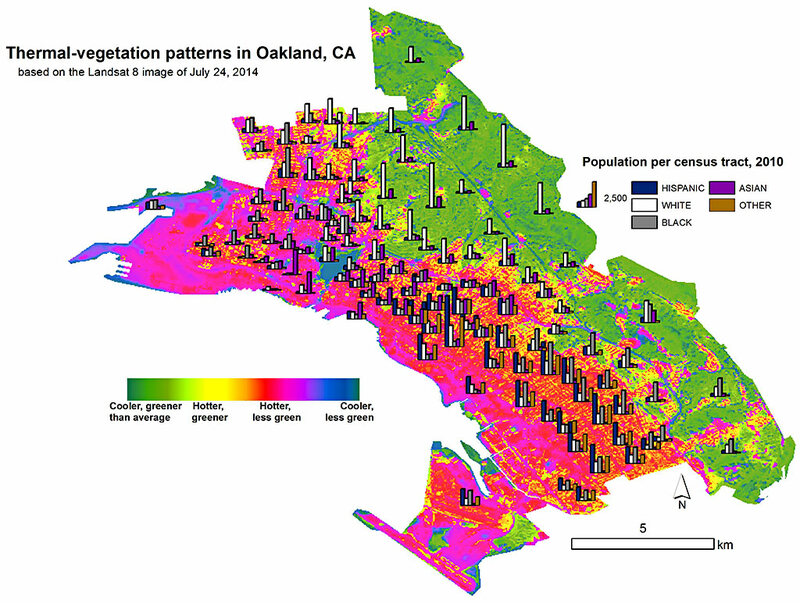 UNBOUND re-establishes variation and connectivity in native ecotones by expansion of the floodplain and a major vegetation palette overhaul. It reimages the site as a valuable multifaceted space that provides on both a social and ecological level. I am proud of this team that I assembled and of which I was a part. Many of the concepts (and physical realities) that Unbound engaged are paradigmatic of the challenges for environmental designers and engineers in the contemporary context. How we might adapt old infrastructure — too rigid, too small, and too close to dynamic natural places and forces — is a vexing question, and one at the center of urban adaptation endeavors the world over. Nate Kauffman (M.L.A. 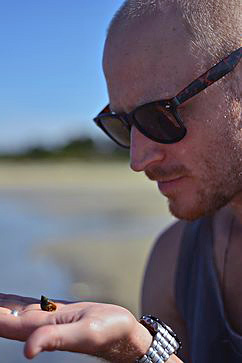 ’14) teaches graduate landscape architecture studios at UC Berkeley and their Extension Campus, and is the Founder of LEAP: Live Edge Adaptation Project.